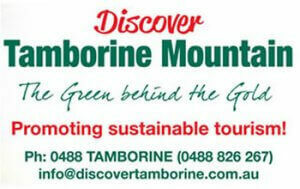 Eating Out on Tamborine Mountain – Discover Culinary delights with the “DTM Eating Out Guide”! This new guide has something for everyone – from Take-Aways and Cafes to Family Restaurants and 5-star Fine Dining – and everything in between – the DTM “Eating Out Guide” solves the question asked so often – “Where is a good place to eat?” or “Where do you get a great cuppa on the mountain?” The utmost care was taken when collecting lots of information for each eatery. 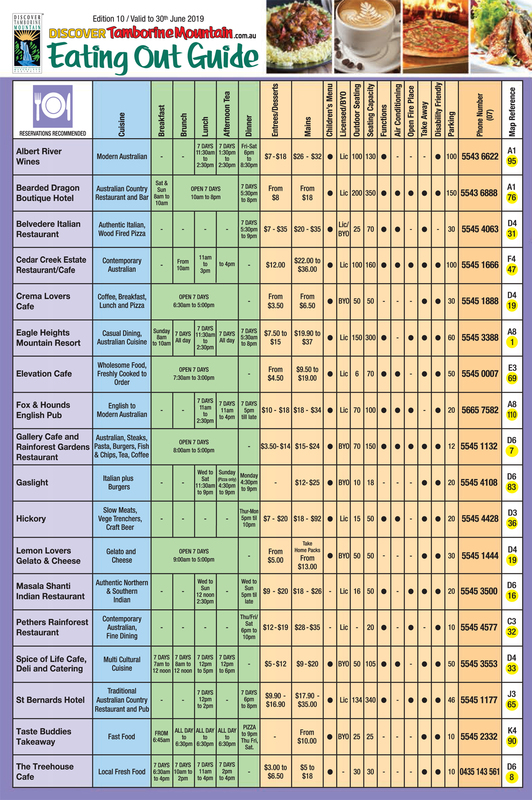 DTM has compiled a comprehensive list of not only where each outlet is located, what type of food is served and the opening times – the guide goes into much more detail showing also information such as BYO / Licensed, seating capacity, if the place is air conditioned or not, or has a fire place, whether there is secure off-street parking (and how many spaces! ), or a children’s menu, disabled access and so on. 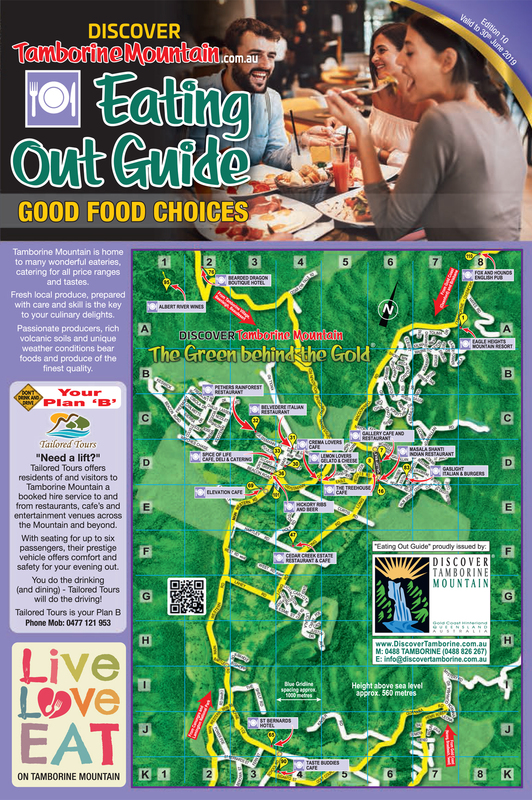 The “Eating Out Guide” provides all worthwhile-to-know information of each featured eatery – it is the “Whose Who” of good food outlets on Tamborine Mountain! And if you need a lift – Tailored Tours/Tamborine Transfers offers residents of and visitors to Tamborine Mountain a booked hire service to and from restaurants, café’s and entertainment venues across the Mountain and to the Gold Coast or Brisbane. With seating for up to six passengers, their prestige vehicle offers comfort and safety for your evening out. You do the drinking (and dining) – Tailored Tours will do the driving! Tailored Tours is your Plan B. 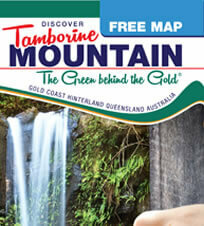 Below you find the downloadable and printable version of the guide, but it is also available from all good accommodation houses on Tamborine Mountain, as well as many other places you might visit when exploring all the great things on Tamborine Mountain. Cheers – and enjoy your meal!! 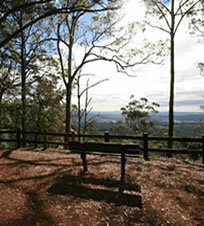 A comprehensive overview of all good Eateries on Tamborine Mountain! 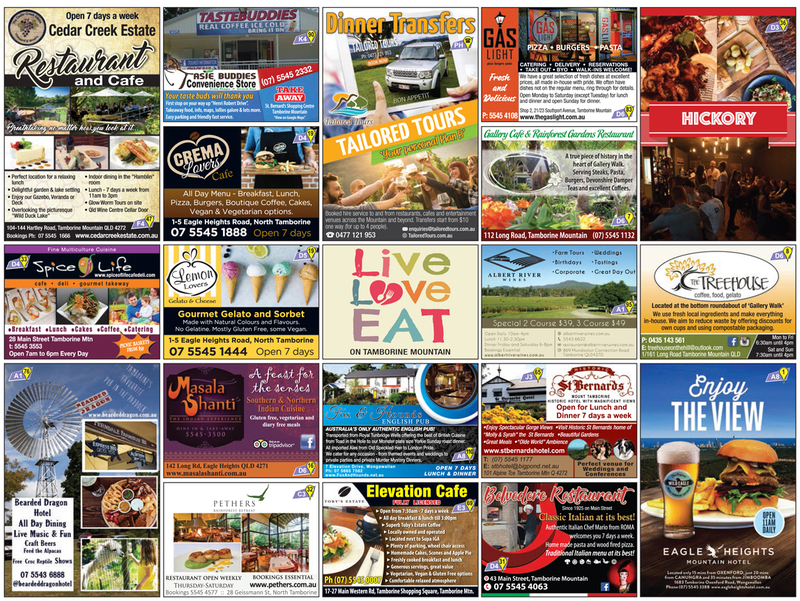 Good Food outlets are located all over Tamborine Mountain! The “WHOSE WHO” of good food and yummy treats on Tamborine Mountain! This entry was posted in Eating Out, Eating Out Guide on May 1, 2014 by Detlef.